It's almost that time. Classes start on Monday. It's everything I have been working for since 2005. It's everything that I put on hold while I was sick. This is it! I will begin nursing classes and I am ready. I am nervous. I am scared, but I have learned this is probably a wise feeling. I haven't met a nursing student yet who didn't have a mild breakdown, or two (or three). So I am prepared. I hated having to take a break for so long but there was no way I could do anything in 2007. I had been sick for quite some time without knowing what was wrong. I took a yoga class in 2005 and 2006 and wondered why some positions were so hard to twist my neck into. Literally it would cut off my air supply. I would choke. I had to tell the teacher there were just some positions I couldn't do. Of course we blamed it on thyroid at that time. By 2007 I was honestly barely standing. I was so tired and weak. I could hardly breathe through the panting and wheezing. Then I was bedridden, for a long time. I finished up my classes though in 2007. The only thing I didn't do was take my Algebra final. I had pushed through it all but knew I couldn't study for or make it through that test. 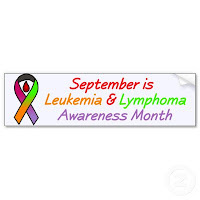 I had been told I most likely had Hodgkin's Lymphoma but they were still waiting for the official diagnosis. I had barely known for 2 weeks I was pregnant. My life was a whirlwind. So my teacher let me just keep the A I had in the class without taking the final. I'll never forget it and wish I could tell her now what that meant to me. I didn't go back to school until the summer of 2009. I had been accepted into the Nursing College and needed a few more prereqs. They told me when I started my course load in the fall they thought it was too much. I told them I had to do it. I did! Now everything I have worked for is here. I got my books. I worked it all out it seems at this point. So I could use prayers and some good luck! That's how I think of it. Technically I believe that applies to faith but hey, it takes that to get through a cancer diagnosis right? I have had the pleasure of coming across so many people on the Internet, after starting this blog, who have fought that fight. I have seen some have it worse than others. I wonder how I got a cancer that was so rare, yet for the most part very treatable. Note that not everyone is easily treated. I have met far too many people who the treatment did NOT work for and it recurred once or many times. Stem cell transplants, more chemo and all of that is not easy. It's hard. And it's scary. It's so scary not knowing what the next day will bring. It's hard not knowing if it's going to come back. It's hard to not know if you should be planning for your future. I finally let go of those fears because they did me no good whatsoever. By giving into those fears cancer continued to steal my life. I won't let it. Even if it came back and took me I refuse to fear it. It stole my dad from me. I won't let it get to me. Yes I look at cancer as an enemy to fight. I will fight it. I won't just fight my own fight either. I am going to be a nurse so I can fight it. It's kind of like a solider going into war to fight the terrorist. My enemy just happens to be a disease. Found this one, that apparently you can all vote on. I had to pick my favorite picture that I have taken and that's that. Now I wait. So if you want to vote for my pic and help me out, go here. Thanks!!! On Facebook tonight I posted a status update that I saw on a friend's status. It told me to list those I know including myself, that are suffering or have suffered from a specific type of cancer. You put that person's name, their cancer type and ribbon color. It's a way to promote awareness. I realized how many ribbons there really are out there. I began searching and found a page that I love! It lists ribbons I frankly didn't even know existed. I cannot believe how many causes there are out there. 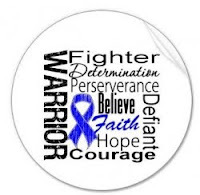 But if you are looking for a ribbon color for a specific type of cancer here are a few and a link to the site I found. Leukemia, hunger, kidney cancer, racial tolerance and cultural diversity, Underage drinking, etc. There are so many things that the orange ribbon can stand for. I had no idea. Green: depression, bipolar disorder, leukemia, kidney cancer or disease, non-hodgkin's lymphoma etc. Pancreatic cancer, domestic violence, cancer survivor (didn't know that), Chron's Disease, etc. So many I didn't know! Violet: Hodgkin's Lymphoma, I think it may stand for more. However on this site it says Lavender and gives Hodgkin's and other. Technically Hodgkin's is a violet ribbon. The others MAY be lavender, not that there is a lot of difference but I am not going to list anything else because I don't want to be wrong!